Haste makes waste and lots of angst! 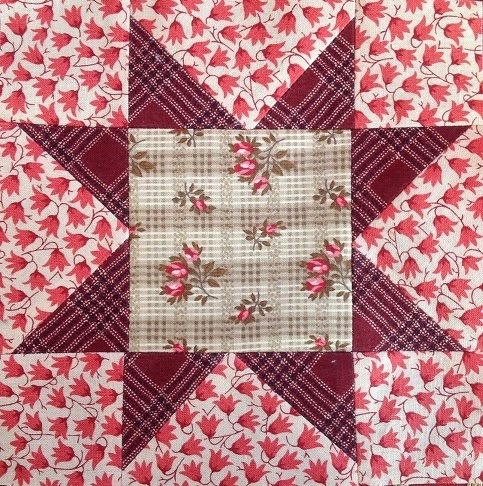 In order to reach my goal of nine months - start to finish - on my dear sweet baby Jane, I neglected to measure my 4 corner blocks to "my" quilt borders and simply used the measurement in Brenda's "Dear Jane" book. This is in NO way a fault of the book. Making this in the potholder method, I should have waited until all the borders were on before I cut out AND appliqued my corner blocks. Long story short (too late, I know) I had to once again fudge my way out of it. I'm not sure if you can see how I had to rip off the circles and place them lower. The text may lose a piece of a letter here and there, but it will have to do as I am not doing them over!! "stitch all day, so my worries melt away". As the Wizard says, "pay no attention to that man mess behind the curtain"! Sorry I haven't much to post this morning. 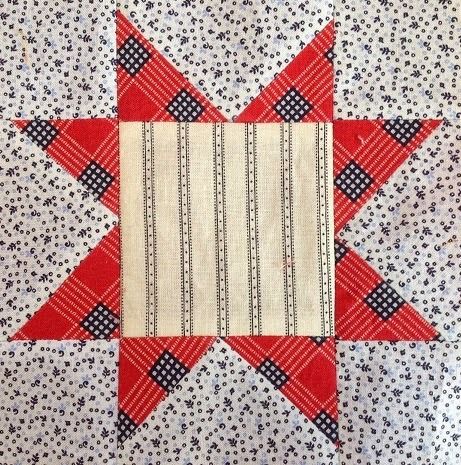 Do check out Cyndi's (Busy Thimble) this morning as she has posted some great quilts from the Prussian Blue exhibition at the New England Quilt Museum and a wonderful block she made based on one of the quilts. Amazing!! Mind in a Time Warp! Hmmm... I was merrily stitching my happy little Jane blocks together when all of a sudden I noticed something funny. Yup! I must have been daydreaming about my next potholder quilt (already in the planning stage) because I just kept stitching right around the corner. 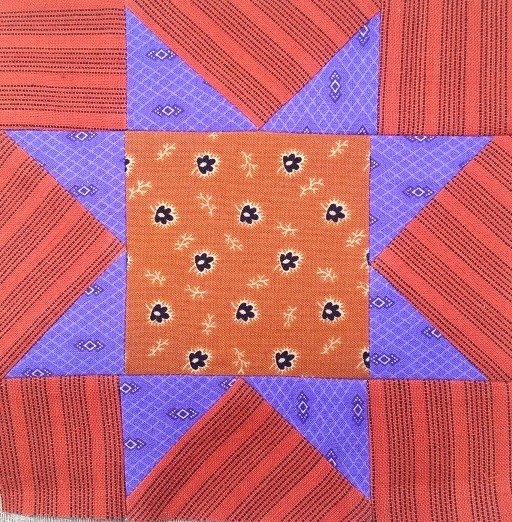 Now, when anyone asks me how these potholder quilts hold up over time, I can tell them it takes a lot of effort to "unstitch" them!!! This is how the row should look!! It reminded me of when my daughter was around 6 years old (almost 30 years ago), we used to volunteer in a nursing home. One day we were making some 4-patches with some ladies and one lady did exactly as I just did. My daughter said "Mummy, shouldn't I tell her?" I explained that as long as she was happy with what she was doing, that all would be fine. Funny how life's lessons continue forward! Although I can't say I was all that happy to have to unstitch it, I did have a good laugh! I actually had a hard time starting to stitch the rows together. I was having a good time just playing with the little blocks. This is the last look at them in their infant stage. Now they will all be grown up into rows. A big thank you to all the 4 legged friends I have loved. When Barbara first announced this week's fabric - printed plaids - I thought, great, I have lots of them. Lo and behold, when I went to look, I had far fewer than I thought. I've been trying to make these little stars from my scrap baskets rather than my (somewhat overwhelming) stash. I had to hit the stacks for these printed plaids. I am pleased at how the borders are coming along on my "Cooking with Jane"
I was nervous at first as some of them seemed a bit off - see how this one doesn't quite come to the end. No worries, I simply pinned it where I wanted it to be and coaxed it into place. It's amazing how much I can coax! Look at that camber! But it all works out in the end. I'm the queen of "fudging"! After the borders, the inner blocks will be a cinch to whip together. 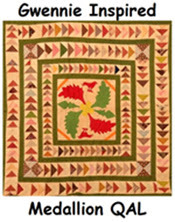 I use a modified ladder stitch to whip them together. I have tried a true ladder stitch but I don't feel it is strong enough and a don't like a regular whip stitch as it is visible from the front so I use a stitch that is part ladder and part whip. Like I said - queen of fudging! as I seem to have thousands of them in my sewing room. Here are my two "foulard" stars. Oops, why didn't I notice that mismatched seem before? 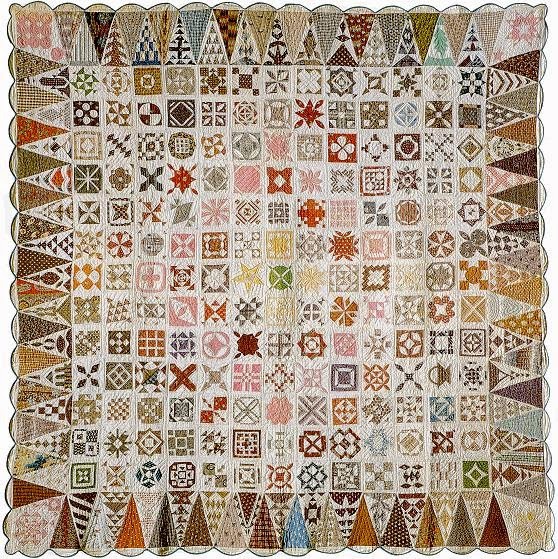 Oh well, what would a nineteenth century quilter do? Leave it of course! 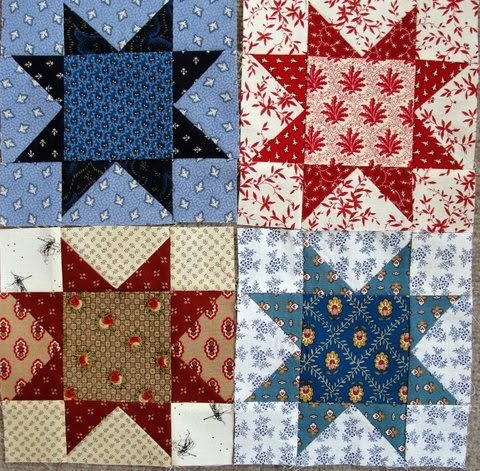 And here are my friend Karen's blocks. She is all caught up now! Thanks for letting me share them Karen! A super postcard and another Time Warp "jump in". My friend Tina (no blog, although I think she should start one!) has jumped in to the Time Warp. She stopped by Busy Thimble while I was there yesterday to see if she was using the right fabrics. Cyndi and I agreed that she is right on target. Of course she still needed a few things to add to the pile! After all we don't know what Barbara will chose next. 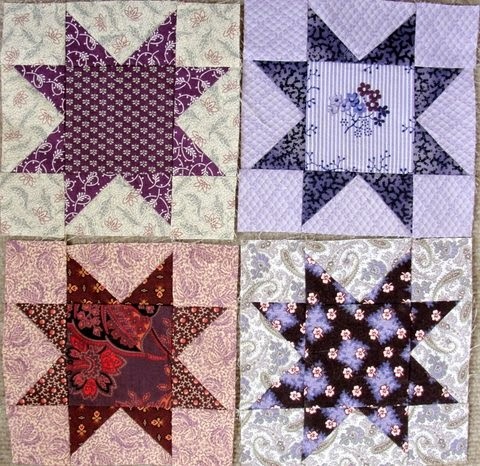 I didn't get my foulard stars done yesterday but will do them this weekend. I seem to have a closet foul full of foulards! Thanks Tina for sharing. 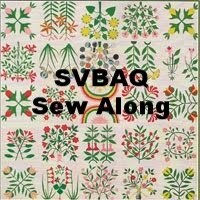 I am fortunate to have many wonderful friends that I quilt with from time to time, but has been such a treat to have found new friends through my blogging adventures. I love it when people comment on my posts, but this week I was lucky enough to get a "special" card in the mail from a fellow blogger. 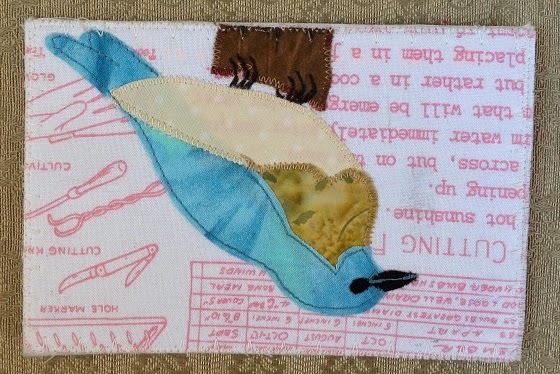 Debra from "My Life is a Stitch & Random Things that Make Me Smile" (one of my favorite blog titles by the way) sent me this beautiful hand made postcard. I'm sure she didn't know it at the time, but it was just what I needed that day! 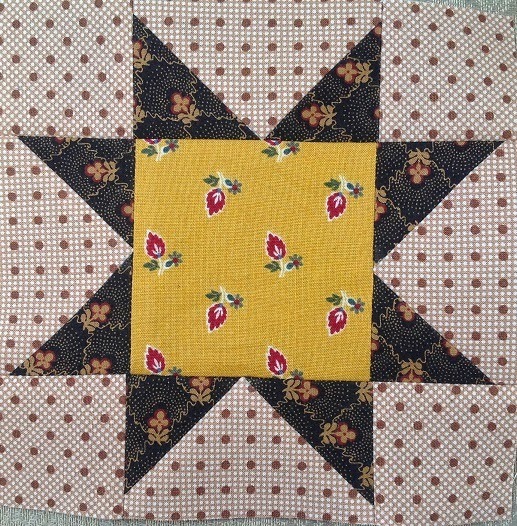 I like to think that most quilters are full of the "random act of kindness" spirit, but it is always nice to be on the receiving end. Thanks Debra! Sorry, I have tried 6 times to turn this right side up - argh! You will just have to stand on your head to see how beautiful it is. I need to take a tech class!!! Maybe it just wants to fly upside down today. I just went to Debra's blog (here) and you can not only see this rightside up, but she will show you how she made it. 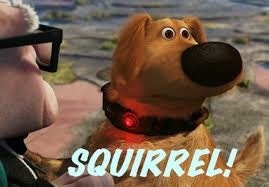 You can also see the real things sitting on a fence! Thanks Debra. I have, however started to whip stitch my little potholder blocks together so it shouldn't be long before it is a full size treasure! It has been a fun journey.